Video chatting has become one of the biggest features of the mobile industry. With the introduction of FaceTime on iPhone by Apple, video chatting has become a hotspot for developers and investors alike. Even before the introduction of FaceTime, the futuristic feature existed on both iOS and Android but it isn't something that could be used on a daily basis by the users. Then, once the market heats up, many developers realized the importance of this feature and started coming up with new apps supporting it. And though, our very own Android comes with built-in voice and video chat courtesy of Google Talk, it sometimes isn't enough for users who want something more from their face-to-face communication. So, to fill in that need, there are many apps in the Google Play Store that you can download and install for free, and in this article we’ll be listing the best of those. Though many apps offer video chat functionality, group chat is something that only a few apps offer and Fring is one of them. The free application lets you group video chat with up to 4 friends at the same time. What’s more, Fring comes with DVQ technology that makes high-quality video chat possible on speedy networks. Apart from offering group chat, the application also offers normal video calling functionality for free. That is, if you’re a Fring user and so is your friend, you can call them up for free. The same is true for group chat as well as text chat. Though not a Skype-killer per se, it can be used as a good tool for chatting with multiple people at a time. 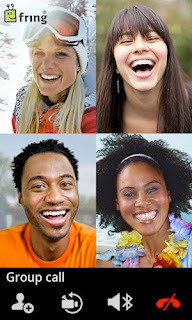 Bringing free group video chat, VOIP calls and IM for Android comes FriendCaller. It’s an application that lets you turn your smartphone into a complete Voice Over IP (VOIP) solution. Furthermore, you can use it as a group messaging solution as well as a Skype-like video chatting application. When it comes to its killer feature, that is group video chat, it definitely outmatches the aforementioned Fring by offering group chat with 7 participants at the same time. Moreover, FriendCaller also gives you a personal phone number along with caller ID thus acting as an economical and feature-laden alternative to your regular phone. Though Google Plus is an app for checking your messages and updating your status, it can also be used as a great video chat solution. With Google’s killer Hangouts functionality, you can now video chat with multiple people at the same time without leaving your phone. Though Google Plus can’t be used as a full-fledged video chat solution, it does, however, work great when combined with the video chatting functionality of Google Talk. 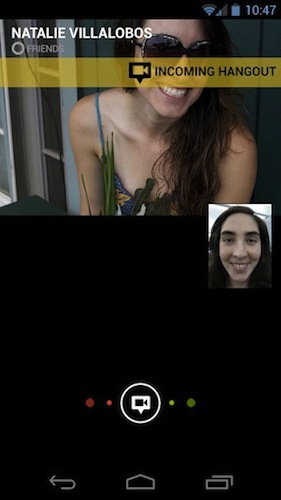 Tango, much like other apps on the list, brings a certain amount of twist to the traditional video-chatting feature. Once installed, the app lets you make free video calls, phone calls, and even send video messages to other Tango users. The group video messaging, Tango’s latest feature, lets users record personal videos and share them with their friends, very much like voicemail. What’s more, you can also send video messages to non-Tango users, thus making the functionality much more accessible. The other great thing about this app is that it doesn't take much effort to get started with it. There’s no login and password to enter or an account to create, it just works out of the box. Definitely worth a try even if you’re hooked on Skype. Well, what can you say about Skype. 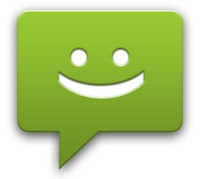 It’s definitely the most popular video-chatting and even voice-chatting solution across all platform. Now owned by Microsoft, the service lets users communicate with their ‘Skype buddies’ from almost every corner of the world and from almost every popular device. Chances are, if you’re reading this article, you must be a Skype user already. If you aren't, go ahead and install it now. there are lot of group calling apps out in the market but they all have different stories. skype charge to much for group calls. others don’t provide it for multiple users same time like oovoo and fring. just read about friendcaller who provide 7 way group video chat, is it true? 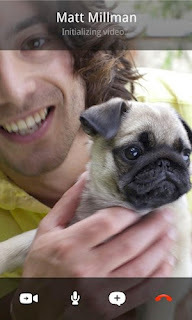 here is the reference http://fc.vc/group-video-chat.